There doesn’t seem to be total agreement on the best place for your laundry room. Some people want it on the main floor, some on the second floor, and many still prefer it out of the way in the basement or garage. However, more and more people are deciding to locate their laundry rooms on the second floor. If you’re among those considering buying a home with a second floor laundry, or moving yours up from the basement, here are some points to consider. 1. No more trips up and down stairs carrying laundry baskets full of clothes, and swapping out loads. Towels, sheets and dirty clothes make up the majority of your laundry on the second floor, so it makes sense to have the laundry room close to hand. 2. This is also a great location for those with back injuries, herniated disks, or arthritis who can’t carry heavy loads on stairs. 3. Some people have two laundry rooms — one on the main floor where the master bedroom is located, and one on the second floor for the kids. Teenagers do their own laundry, which is very helpful to busy parents. 4. You can get rid of your hampers in bedrooms and bedroom closets, and move them to the second floor laundry room. This frees up valuable closet space, and saves you time collecting clothes from all the rooms. When getting the kids ready for bed, throw their clothes immediately into the laundry hamper where they’re handy for washing. 5. The laundry room is close for emergency loads if one of your young children has an accident during the night. 1. Noise from the washer and dryer can interrupt sleeping, especially for babies and children. It can also be annoying if you’re trying to watch TV or read in the bedroom. 2. Some older homes don’t have the enough floor support to handle the power of the spin cycle. The washing machine can “dance” and “walk” and this can be problematic, even if there is adequate floor support. 3. Running the dryer in summer can make it hotter upstairs. 4. A washer overflow or a broken water hose can cause a great deal more damage to the house if it occurs on the second floor. Fear of flooding is one of the primary reasons people are hesitant to install a laundry on the second floor. 5. If you do most of your laundry when the family is at home and spending time together, you might find running up and down stairs to the second floor to start the laundry, swap loads, load the drying rack, and fold, to be as inconvenient as doing laundry in the basement. Fortunately, there are solutions to some of the problems encountered with a laundry room on the second floor. At the planning stage, set up the laundry room away from your bedrooms if at all possible. For the laundry room construction, use wallboard made from two layers of 1/2–inch or 5/8–inch gypsum for walls and ceilings to dampen vibrations from the washer or dryer. Fill wall and joist spaces with sound attenuation insulation batts, rigid foam, or spray–in insulation to prevent sound travelling to adjoining rooms, and to those above and below. Install a door to the laundry room and keep it closed when running and drying loads. 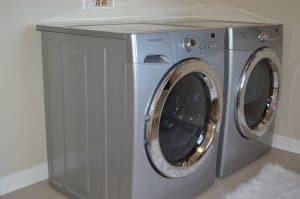 For stackable washer/dryers, enclose them behind bi-fold doors to reduce the noise (make sure the doors are ventilated). Work with a professional, such as a structural engineer, to make sure your floor can support the weight and vibrations of a washer and dryer. If your floor structure is sound and your washer is still vibrating, check to see if it’s level, adjust the legs as needed, then place vibration pads under it. You’ll need to check the level every few months to make sure it hasn’t gone off-balance (you can check the dryer as well). Front load washers are particularly prone to this because of the higher spin speeds. You can use a carpenter’s bubble level or an app on your smartphone to do this. If your washer still has vibration problems, make sure you’re loading it properly with balanced loads. A stacking kit is often included with stacked washers and dryers, which keeps the whole unit together and stable while running. If it’s missing, or wasn’t installed properly, it could cause the washer to go off-balance and vibrate, especially during the spin cycle. Also, make sure any screws are tight on the kit. If they’ve worked loose, they could cause the machine to vibrate. Ideally, replace your older appliances with newer, ultra-quiet washers and dryers. During the summer it’s better to do laundry at night when the upstairs is relatively cooler. If you have a self-contained laundry room, make sure the door is closed. Use an air conditioner or fans to keep the area comfortable. You can also use a dehumidifier to keep the humidity between 30 and 50 percent. Also, consider using drying racks, and a frame clothesline positioned over the washer to cut down on dryer time for some items. Dryers generate substantial amounts of heat, moisture, and lint at any time of the year, which is why ventilation to the outside is absolutely necessary to prevent damage to the home and to keep your family safe. Venting inside exposes you to the risks of fire, carbon monoxide poisoning, and respiratory difficulties. The American Household Appliances Association recommends that you “use the shortest, straightest vent length possible”, using “rigid or semi-rigid sheet metal venting (never plastic)”. Closet installations also require a vented door, dryer ventilation outside, and additional space around stacked machines to dissipate dryer heat. You want easy access to a shutoff valve for the washer in case of flooding or leaks. Install a recessed washer box (there are different types found at home stores) in the wall right behind the washing machine. A recessed box can supply, for example, a single shutoff lever, dual water connections for the water supply hoses, and a drain for the washer’s discharge hose. Mount it so the bottom of the box is level with the top of the washer’s control panel for easy access. You can turn off the water supply for safety when the washer’s not in use. Another option is to install an automatic water shutoff valve that immediately turns off the hot and cold water supply as soon as water is detected under or near the washing machine. Most sound an alarm, and some can be connected to a security system that calls your phone. Alternatively, you can invest in an “intelligent” auto water shutoff valve, an electronic control device that allows water to flow only when it senses the washing machine is turned on. Its floor sensor also turns off the water supply and the power to the washing machine. There are even smart home automation systems that will turn off the water main if a leak is detected in the laundry room. The system will send you alerts by phone, email, or text, and you can even shut down or open your main water supply remotely. Replace rubber hoses with no-burst steel braided ones. There are even auto-shutoff steel braided hoses. When they sense too much water flow, they automatically turn off the water supply to your washing machine. Place a drain tray under your washing machine to catch any overflow. The tray’s drain isn’t directly connected to the house’s main sewer line. Instead, it’s an indirect line that diverts the water to a floor drain, laundry tub, or outside through a wall. It’s better to use a metal tray rather than the plastic ones that can crack. Wherever you decide to locate your laundry room, C&W Appliance Service will keep your machines in top running order. Callus at (214) 358-1496 or (855) 358-1496 for the best in appliance service and repair.